Dewgong in game: 700 Who? Important notice! 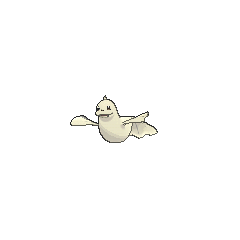 Pokemon Dewgong is a fictional character of humans. 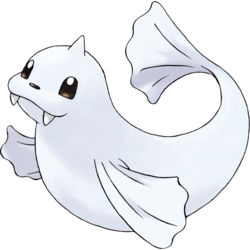 Dewgong is a pinniped Pokémon resembling a sea lion. It has a snowy white, furry body, which renders it virtually invisible in snowy conditions. Its face has two black eyes with no visible sclerae, a black button nose and two tusks extending from its upper jaw. It has a streamlined body with two front flippers and a long flowing tail. Even in extremely cold and ice-packed waters, its tail allows it to be a swift and agile swimmer at speeds of 8 knots. On top of its head is a sharp horn, which allows it to cut and plow through even the thickest of ice floes. It lives on icebergs adrift in frigid ocean waters. It thrives in lower temperatures, becoming increasingly more active the colder the weather gets. By storing thermal energy within its body, it is completely unharmed by even the most intense freezing weather. During daylight hours, it sleeps on bitterly cold ice or under shallow water. However, at night when the temperature drops, it becomes a hunter and searches for prey. In Mewtwo Strikes Back, a Dewgong owned by Neesha was one of the Pokémon that were captured and cloned by Mewtwo. 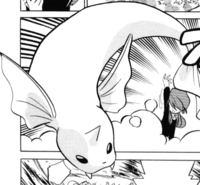 The Dewgong clone reappeared in Mewtwo Returns. 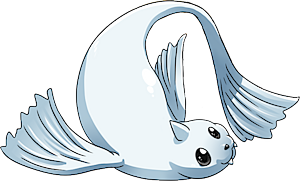 A Dewgong has also been used by Pryce in Rage of Innocence, As Cold as Pryce and Nice Pryce Baby. He also owns several of them at his Gym. 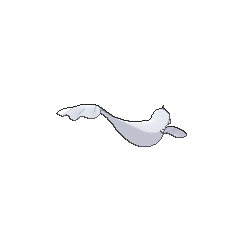 A Dewgong also appeared in Up Close and Personable!. 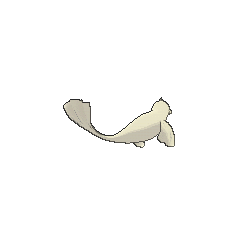 Multiple Dewgong were among the Pokémon seen at Professor Oak's Laboratory in Showdown at the Po-ké Corral and The Rivalry Revival. 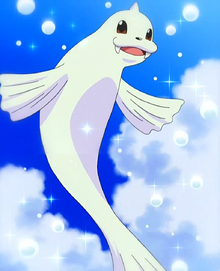 A Dewgong appeared in The Joy of Pokémon where it plays with Ash, almost causing him to drown. Three Dewgong appeared in The Joy of Water Pokémon. Two were living in Lake Lucid, while the other one was receiving special treatment in a salt bath tank in the Pokémon Center near the lake. A Dewgong was among the Pokémon stolen from the Pokémon Center of Blue Point Isle in Around the Whirlpool. A Dewgong was seen at a Pokémon Center in The Legend of Thunder!. 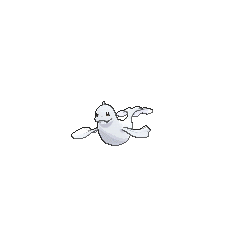 Multiple Dewgong also appeared in The Power of One, Celebi: Voice of the Forest, Pokémon Heroes: Latios & Latias and Destiny Deoxys. A Dewgong was owned by a family of traveling circus performers in Pokémon Ranger and the Temple of the Sea. A Coordinator's Dewgong appeared in Dawn of a Royal Day! competing in the Arrowroot Town Pokémon Contest. A Dewgong appeared at the beginning of Zoroark: Master of Illusions. Dewgong first appeared under the ownership of Lorelei in Do Wrong, Dewgong!, in which it combined its Ice Beam attack with Cloyster's Spike Cannon attack to try to bury Yellow and Bill alive. It is capable of using Ice Beam to create paths of solid ice on which it moves.